To that end, members can sign up to receive as little as two bottles from the club per month, guaranteed to be interesting quality wines. Different membership levels let you choose to receive between two and six wines per month, for one month, six months or one year – with no ongoing committment. 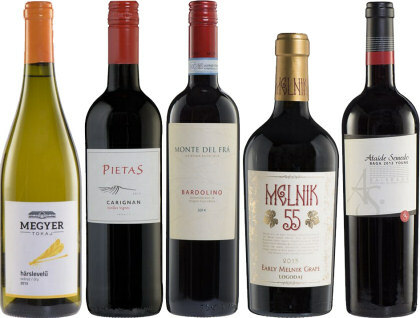 Members can also buy any wines with a 10% discount. I have now sampled several wines from the Daily Drinker club selection, which have been excellent: not just very good quality, but offering something out of the ordinary such as the five wines reviewed below. Visit TheDailyDrinker.co.uk for more information. (2016) Harslavelu is one of the principle grapes of sweet Tokaji, but we are beginning to see more dry white wines made from Tokaji varieties on the shelves. This is crunchily fresh with lemon and bold summer orchard aromas, the merest scent of something floral. I'm not sure if it sees any older oak barrels, but there's something a little earthy and gravelly about it, plenty of lemony fruit again, and a clean, mineral salts acidity in the finish. £10.80 for members. (2016) The South of France is an area full of wonderful old vines, so it’s good to see those being celebrated in a wine such as this that brims with juicy black fruit, etched with floral notes and a touch of chocolate or liquorice. In the mouth it overflows with straightforward but delcious black fruit altertness, juicy and fresh, tingling with black cherry skin brightness to the last drop. Watch my Wine of the Week video for my full review, including much more detail and food matching suggestions. £7.65 for members, the Daily Drinker. (2016) From the northeast of Italy, I'm a fan of Bardolino, in this case made from Corvina, and with only 12.5% alcohol in a typically refreshing and agile northern Italian red style. There's small redcurrant and pomegrante fruit notes, a little twig-like steminess and beneath a sweet curranty layer of fruit. On the palate that dry, ashy quality and fruit continues, very nicely fresh with its crisp acids and tight tannins, and whilst a little sweeter and denser than the Baga reviewed below, again not a million miles from the Beaujolais Crus in style. Price for members: £9.00. (2016) Wines from the former Soviet-controlled coutries of central Europe are re-emerging 20 years or so after communist rule ended, which was generally an unhappy time for vineyards which were often not worked to their full potential. Now, more and more excellent wines are appearing, in this case made from the rarely seen Melnik 55 grape variety, aged in French oak for eight months. It’s a full and deliciously svelte and black-fruited wine, the sheen of quality oak and richness of fruit offset by fine chalky tannins and excellent balance. Something a bit different for sure, but never mind that: it’s just rather good. Watch my Wine of the Week video for more detail and food matching suggestions. £9.90 for members, The Daily Drinker. (2016) The Baga grape is a real speciality of the Bairrada region of Portugal, and often likened to either Pinot Noir or Nebbiolo. This 'young' example (the equivalent of 'Joven' in Spanish wines I guess, meaning it has spent little or no time ageing in oak), is buoyant and fresh, with a little Beaujolais-like character, crisp and juicy red fruits and a sappy snap of brightness and briary quality. Enjoyable, unpretentious - and bound to please Cru Beaujolais fans. £10.80 for members.